Peter Jameson says the Blyth Spartans dressing room was “gutted” following their highly controversial defeat at York City but is determined to put things right after it ended in a fifth defeat of the season for Alun Armstrong’s side. 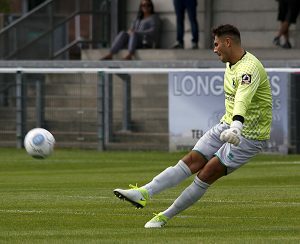 The former Darlington keeper, who also admitted he is “desperate for a clean sheet”, was making his 50th appearance for the club and marked it with a flurry of outstanding saves that looked to have earned a tireless Blyth a point. However, with 11 minutes remaining, referee Ben Speedie adjudged Connor Oliver handled David Ferguson’s cross in the area, allowing Jon Parkin to break the deadlock from the penalty spot. Adriano Moke then wrapped up the game in injury-time, and Jameson revealed the dressing room was “gutted” after the game. “All the lads are gutted, all the staff, the players, we’re gutted,” Jameson said. “Obviously we’re not on a good spell at the moment but the best thing is, we do want to turn things around and make things right. “As a team when I look at us, the players we have are really good. “I think all the fans can see that we are playing well but at the end of the day, especially at the beginning of the season, we were kind of digging our own grave because we were giving daft goals away, and in this league, you can’t. Jameson was in fine form at Bootham Crescent, pulling off two magnificent saves from former Spartans loanee Macaulay Langstaff in the first-half before rising to produce an equally brilliant stop to deny Wes York early in the second-half. The Spartans number one admitted when a goalkeeper is in that type of form, you can start to believe it’s going to be your day but in hugely contentious fashion, Jameson was breached via the penalty spot. “I’m desperate for a clean sheet – really desperate but hopefully we can put it right on Saturday,” he said. After the saves and when the clock’s going down, you are thinking ‘this is going to be it!’ But the penalty – which was never a penalty for me – it’s hard to take, he’s got four goals past us now Jon Parkin. While Jameson’s milestone ended in defeat, the goalkeeper said it was “really special” to collect his 50th appearance for a club he loves playing for. “It’s really special. Since I’ve come to the club, I’ve loved it. Everybody from the chairman down to the gaffer, the players – they’ve just been really, really class with me.